Can someone identify my tree? 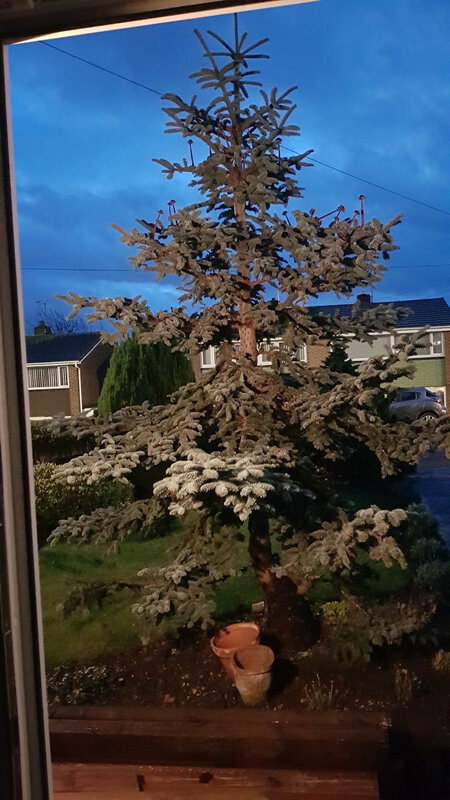 Hi, I was wondering if someone could help me identify the tree I have in my front garden? I moved into my house a year ago but the previous owners didn't know the species of tree. After doing a bit of research I thought it was a blue atlas cedar but now I don't think it is. It has bluey green looking needles and grew vertical candles about 100 - 150mm long in the summer which dried out and dropped to the ground. I've attached some photos to look at. Any help will be appreciated. Rich. Maybe a blue form of abies koreana? Whatever it is it looks like it could do witha good feed and a mulch to perk it up. I can see the similarities when looking up Koreana online. I would take off the lowest, tattiest branches using a pruning saw and cutting close to the trunk. 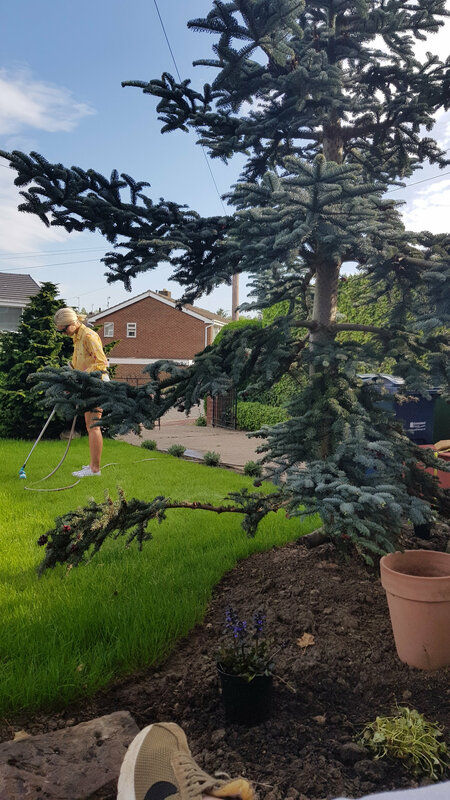 Remove any obvioulsy broken or diseased branches higher up but be careful about shaping. Then get it under it with a rake or cultivator to loosen up the soil and then, after a good rain, pile on a bag of ericaceous compost and rake it level. It needs to be a couple of inches thick. Do this as soon as you can and the worms will work it all in for you over winter. 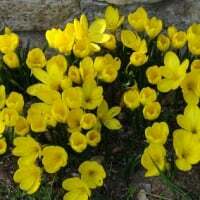 Come spring, give it a couple of handfls of pelleted chicken manure or blood fish and bone scattered under the canopy. Thank you very much for the advice. I'll get my gloves and boots on this weekend and give it a go. I would ask, do you really want to keep it?... it's only going to get bigger, and bigger and bigger... it's close to a path, there is a cable above it that looks like it won't be long before they get in each others way... eventually it's going to have to be removed I would think... a nice idea at the time, when planted young, but conifers like these are really only suitable for very large gardens and park like settings..
That is a good point Marlorena but a lot depends on how far away it is from the house and how much light it will block. I love the blue foliage and would happily have one in my garden, just not close to the house.